Our AGM will be held at the above time at the Dove Room, Murrayfield Parish Church Centre, 2b Ormidale Terrace, Edinburgh. Details of how to join the committee, updates and financial accounts to follow. It’s nearly that time again! We had such a good day at last year’s bake off we’ve decided to hold another one! Sunday 4th September at 2pm. Prizes for the best looking and best tasting cakes plus plenty of cakes to taste and free play fun for the family. Hope to see everyone there. 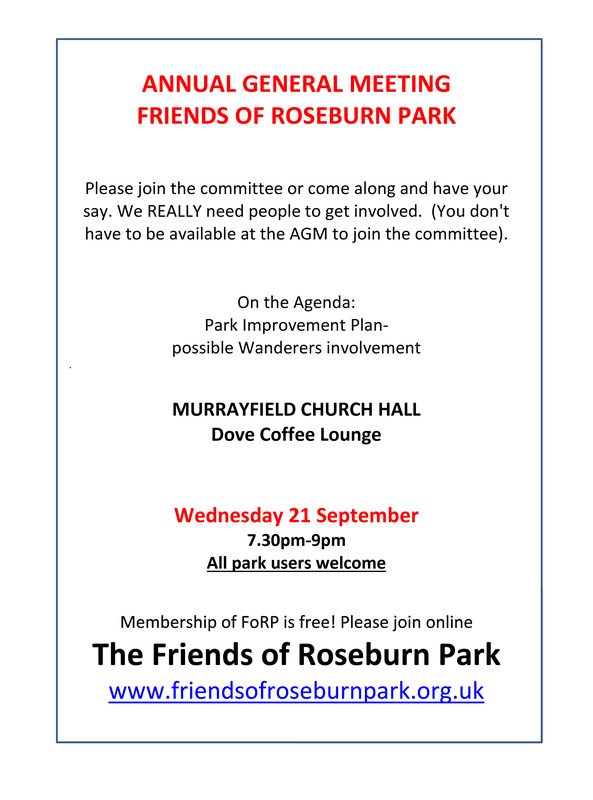 Murrayfield Wanderers Rugby Club would like to invite Friends of Roseburn Park and all park users to an open social event on Saturday 13th August. It is part of our attempt to involve all sections of the club and also the community that surrounds us. Games and outside activities will be available on the back pitches at Murrayfield. Bar and catering will be available in our clubhouse. Just enter via the main gate on Roseburn Street, and follow the road adjacent to the railway, down to the clubhouse and pitches. We hope that you can extend this invitation to all FORP members via your website and Facebook site. 11am – 12.30pm – Kids coaching session, this will be lead by the senior players of the club, on the artificial pitch. There will also be an inflatable set up for afterwards. 2pm – U’18s vs Ardrossan Under 18s on the artificial pitch. 2pm- MWFC Men vs Ardrossan on a grass pitch. The opportunity will be there for anyone who would like to purchase some new club kit for the season. Also joining us on the day will be the Fierce Cheerleaders and a Fijian dance group. Both will put on fantastic performances, so don’t miss out!! There will be food in the clubhouse made by our fantastic caterers along with a bake sale and BBQ, weather permitting. A raffle will be drawn in the clubhouse, after all the games have been completed. Please stick around to see if you can win a prize! All members, friends, neighbours are invited to come along and enjoy the whole (or part) of the day. We look forward to seeing you on Saturday. Thanks , and I hope to meet you on Saturday.